In motorsport, the racing line or simply "the line" is the optimal path around a race course. In most cases, the line makes use of the entire width of the track to lengthen the radius of a turn: entering at the outside edge, touching the "apex"—a point on the inside edge—then exiting the turn by returning outside. As the pack stretched out in single file—carving the black stripe into the pavement that was the racing line—the real competition began. In theory, the optimal path around a race course follows a geometric line, which takes the widest possible arc through a corner. The line starts at the outside of the road, clips a point on the inside, and finishes back outside—while maintaining a constant radius throughout. The clipping point is called the apex. In a 90 degree corner, for example, where the inner-edge radius is 30 feet and the outer-edge radius is 50 feet, the geometric line radius is 80 feet. But while this line theoretically represents the fastest way through the corner, it may result in longer overall track times due to slower speeds on the straightaways. To compensate, drivers often delay the point where they begin to turn, thereby shortening the radius when entering the corner and lengthening the radius when exiting. This late apex line allows for earlier acceleration when exiting the corner into the straightaway, but requires slower speeds going in. Race driver Ross Bentley suggests as a rule of thumb: "The faster the corner, the closer to the geometric line you should drive" in order to maintain more speed through the turn. Conversely, "the slower the corner, the more you need to alter your line with a later apex." Doing so allows the driver to gear down for faster acceleration on the exit. 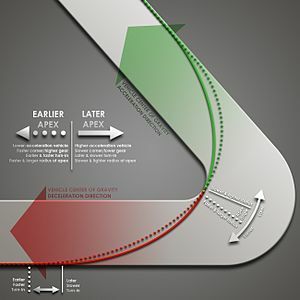 An early apex line, where the driver turns early into the curve, allows a faster entry but a slower exit. The practice is largely considered a beginner mistake. Where two corners are linked together, the goal is to exit the second turn onto the straightaway at the maximum speed. To achieve this, the driver will "sacrifice the line" on the first turn in order to be in the optimal position for the second. ^ Bentley, Ross (2011). Ultimate Speed Secrets. Minneapolis, Minn: Motorbooks: MBI Publishing Company. p. 51. ISBN 978-0760305188. ^ Anderson, George A. (1993). Winning: A Race Driver's Handbook. Osceola, Wisconsin: Motorbooks International. p. 56. ISBN 0-87938-776-9. ^ Baime, A.J. (2010). Go Like Hell. Mariner Books: Houghton Mifflin Harcourt. p. 232. ISBN 9780618822195. This page was last edited on 3 December 2018, at 03:32 (UTC).